A quality luggage tag crafted in a sturdy base metal with polished silver plated finish. These practical and stylish tags are designed in the shape of a sailing boat and include a name and address tag secured behind a clear screen. 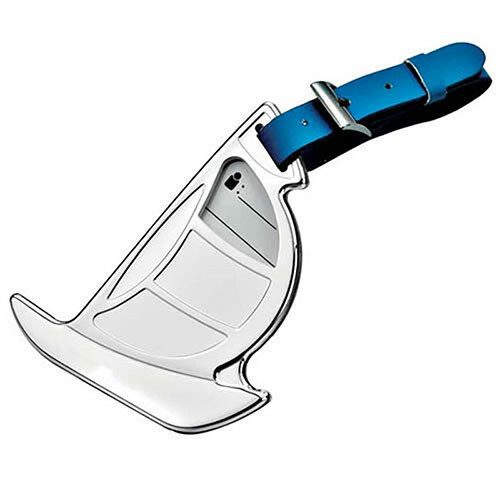 They have a durable adjustable leather strap in a striking blue colour. Ideal as corporate gifts or luxury promotional items for any event with a nautical theme, these sail boat luggage tags can be engraved on the flat front. They are offered here with free text and logo engraving so you can add event details, a company or sponsor's logo, in fact any inscription you choose at no extra cost.